Just starting out as a copywriter, I was given the plum assignment of writing a radio campaign for Killian’s Red beer. 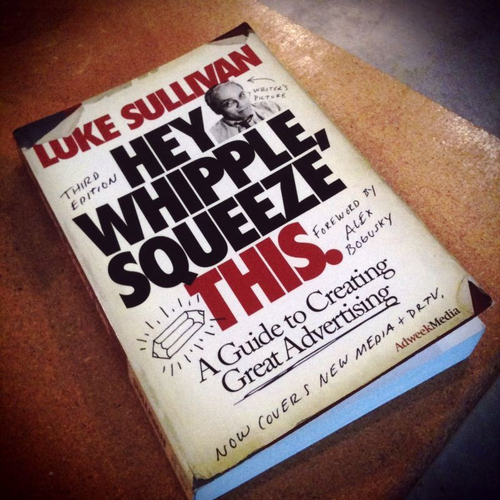 Having recently read Luke Sullivan’s inspiring “Hey Whipple, Squeeze This” (http://tiny.cc/mhcyyw) where he stresses the importance of writing a lot to get to good, I decided to fill an entire legal pad with taglines that could become campaign ideas—and do it all in a weekend. Roughly eighteen hundred lines. The exercise proved fruitful, because it caused me to go through an almost out-of-body experience where I quickly went through writing everything I could think of—rhymes, puns, non-sensical, non-sequitur blurbs, gibberish—just for the sake of filling lines. The less aware of what I was doing, the more interesting it got. And somewhere in there, between the crap and clutter, the line “Ask For It By Color” popped out. It’s not exactly “Just Do It”, but at least it had a real idea to it, a call to action and it inspired a radio campaign that won a few awards along the way. I’m not suggesting writing eighteen-hundred lines to get one is the way to go every time. With experience comes some ability to cut down a step or two. But the point is still the point – being prolific is an important discipline. To say the least. Luke Sullivan is now the Chair of the advertising program at The Savannah College of Art and Design (SCAD) and about a year ago, I was able to thank him personally for the inspiration by recounting the Killian’s story for him. He wasn’t nearly as impressed with it as I was.